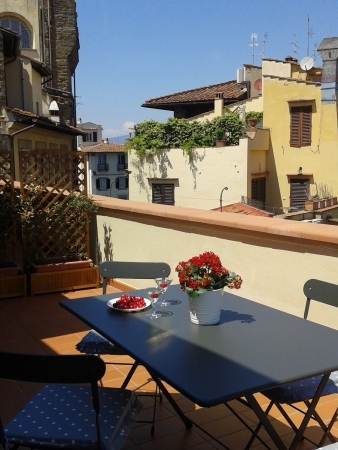 The apartment is located in the heart of the historical center of Florence with its typical small streets, in the Duomo/Tornabuoni districts. 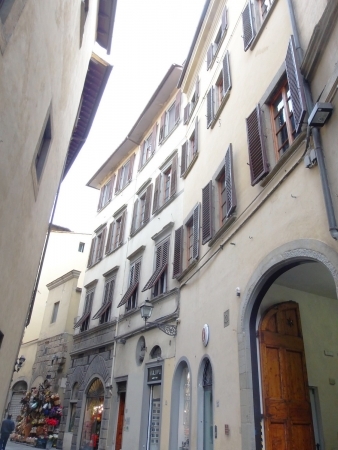 On one side, the Duomo disctrict is a an open-air museum (fully pedestrian) : the Duomo, the Uffizi Gallery, Palazzo Vecchio, Ponte Vecchio… A little bit further, you can find Piazza della Reppublica with its antiques cafés. 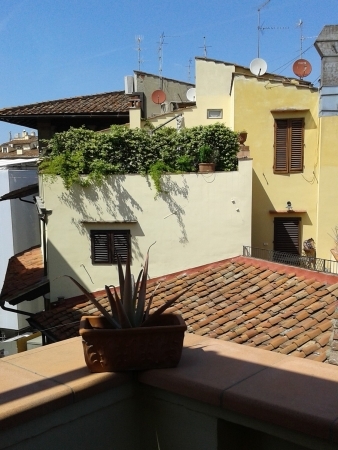 On the other side, the chic and elegant neighborhood of Tornabuoni with Via dei Tornabuoni (also pedestrian) and its Italian and foreign luxury fashion designers boutiques. 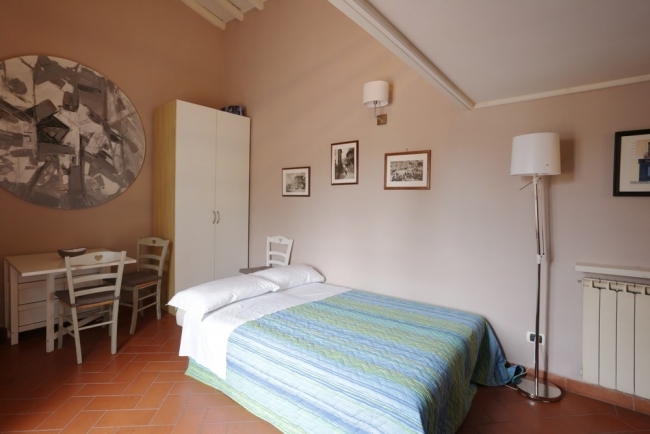 You can find many beautiful Palazzi from the Renaissance period. Very close, Ponte Santa Trinità leads you on the other bank of the Arno river. Consequently, it’s a very central location where the most points of interest are within walking distance. 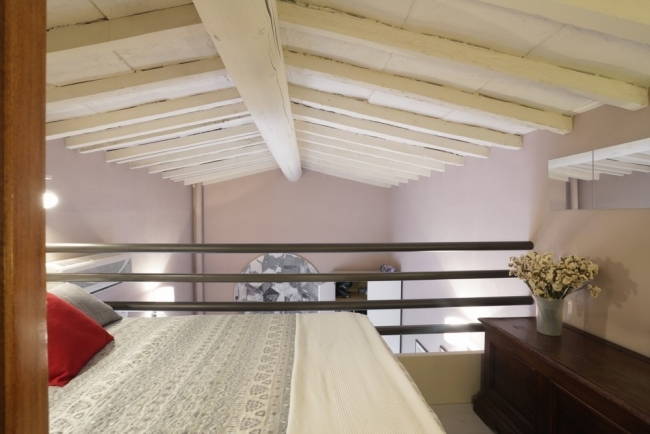 APOSTOLI MEZZANINE is a small and cosy one-bedroom apartment (28 m²) featuring a beautiful terrace with a panoramic view on Florence’s roof tops, the Duomo, Palazzo Pitti and the tower of Palazzo Vecchio, located on the 4th floor of an antique palace that belonged to the noble Florentine Altovity family. 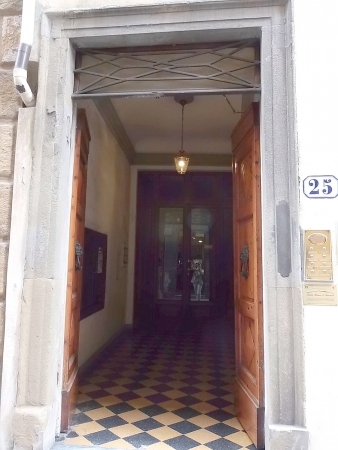 The entrance of the apartment leads to all the rooms. 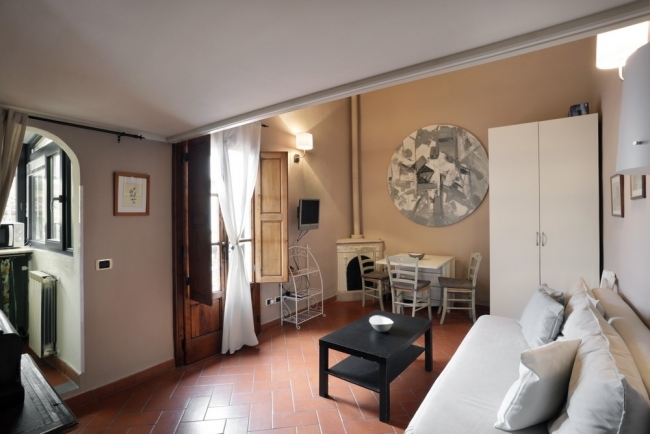 The living-room (17 m²) has a sofa bed, an extendable table with 4 chairs, a small table, a cupbard, and and TV. There is also a small fireplace. A French-window leads to the terrace. 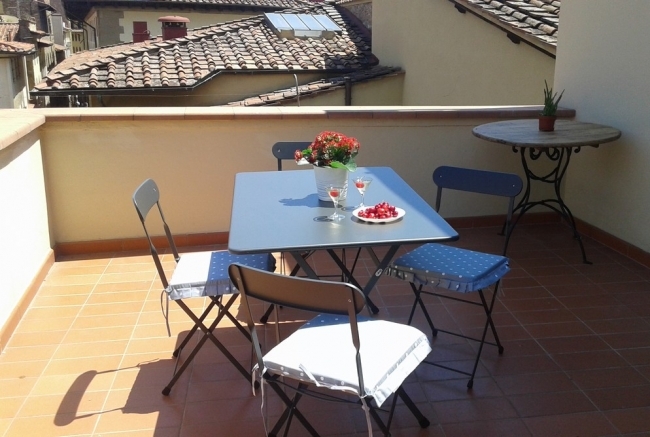 The terrace is wide (25 m²) features an outdoor table with 2 chairs. 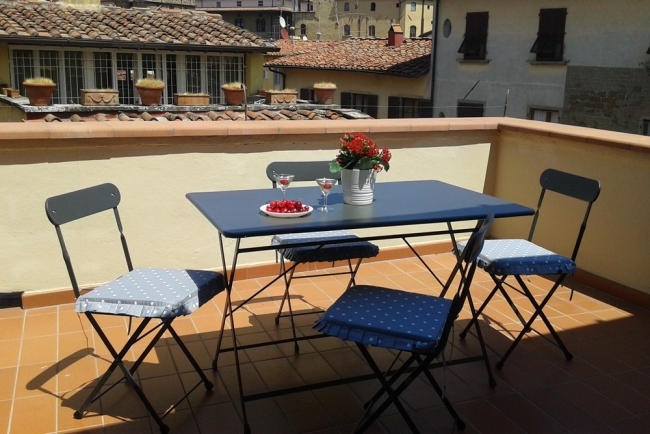 It offers a panoramic view on Florence roof tops and on the Duomo. 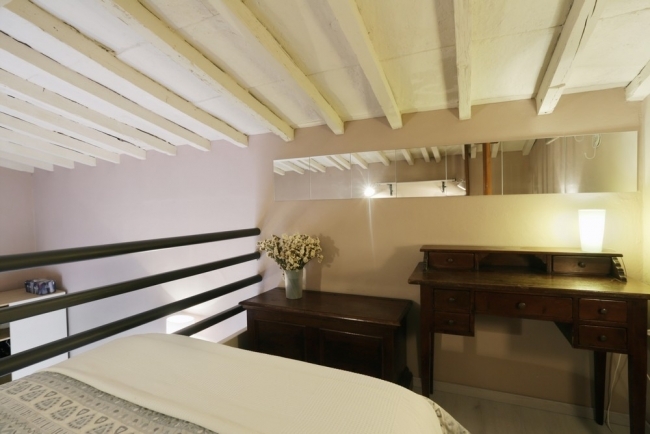 A stairs in the entrance leads to the bedroom in mezzanine (5 m² floor surface area) where there is a double bed, a small desk. It gives on the living-room. Be careful, the ceiling height is low. 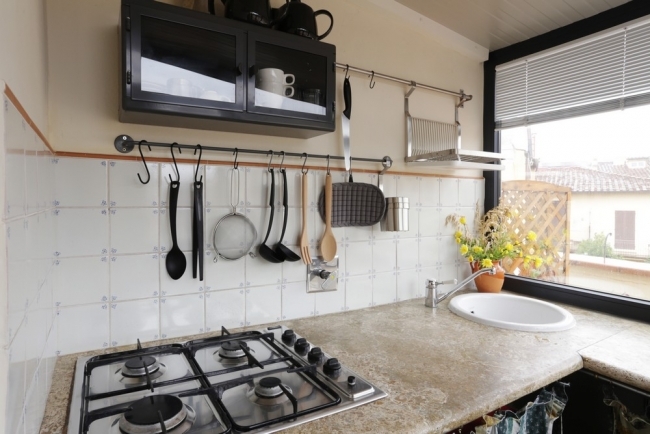 The kitchen (4m²) is separated from the entrance by a curtain. 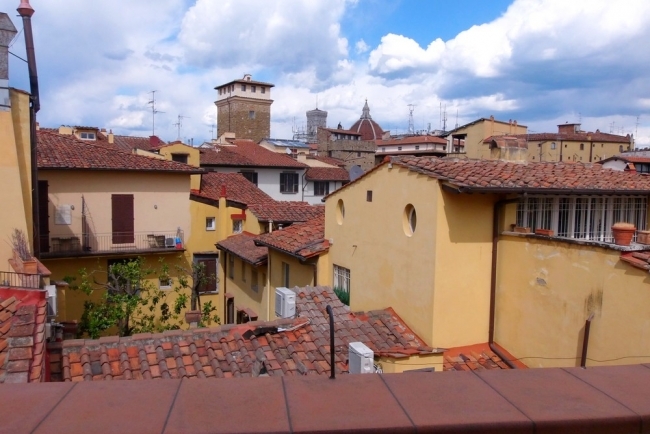 A large window offers a view on Florence roof tops. 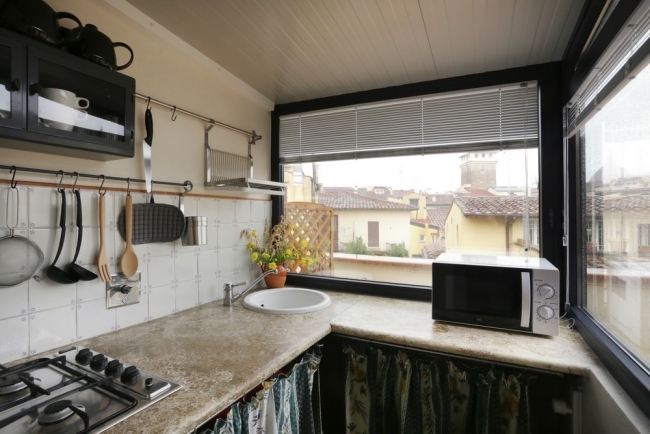 It is fully equipped : small fridge, gas stove, sink, microwave, toaster. 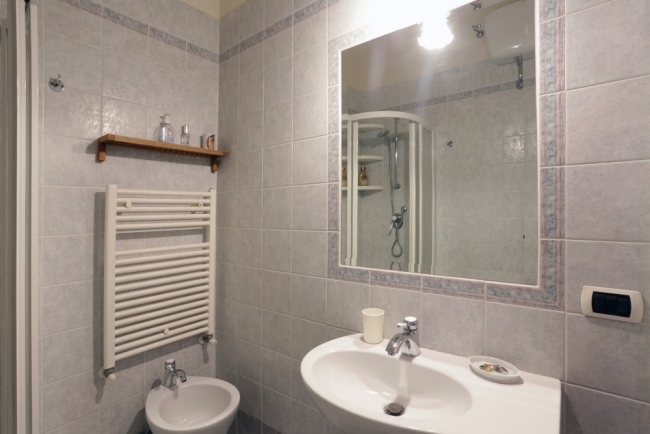 The bathroom (3 m² - no window) is equipped with a shower, a sink, a bidet and WC. 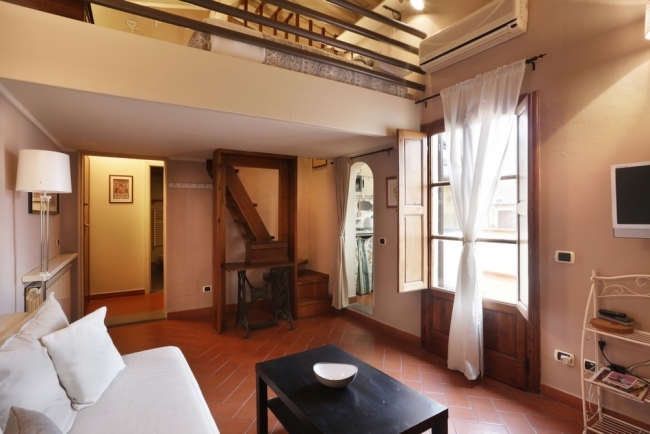 The mezzanine is open onto the living-room and has a low ceiling height. 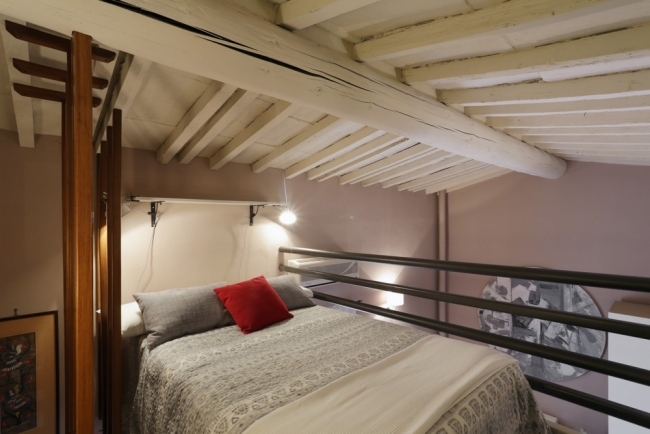 The bed in mezzanine is for 1 guest. 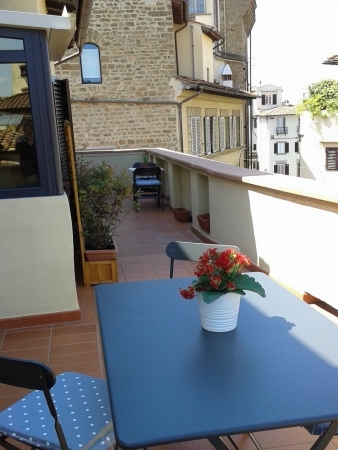 The terrace is adjacent to the one of the APOSTOLI apartment (possibility of renting the 2 apartments together). Be aware that there are a lot of stairs between two floors (more than 90 stairs to get to the 4th floor!). Cost: 6€ one-way (tickets can be purchased on the bus or at the counter in the airport) + 2€ for the city bus (C2). -Get off at « Orsanmichele » stop. 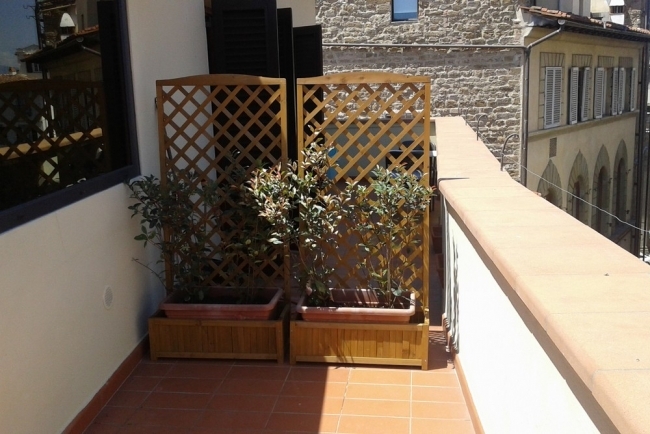 -The apartment is 400 meters away. 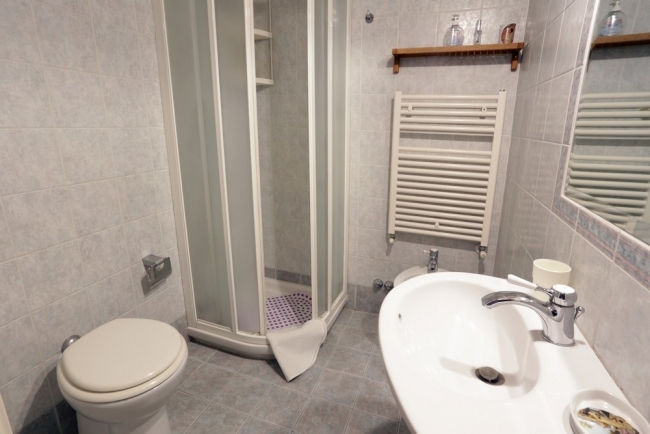 -The apartment will be is 100 meters away. 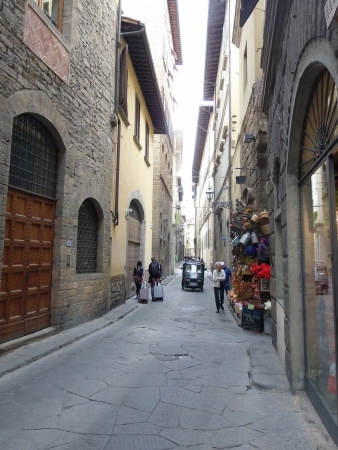 1) Visitors are not permitted to drive in the historic centre of Florence. Traffic is closely monitored by camera and the information is transmitted to the city police who ticket violators. P.S. Please note that you are not permitted to park your car here during demonstrations or concerts. 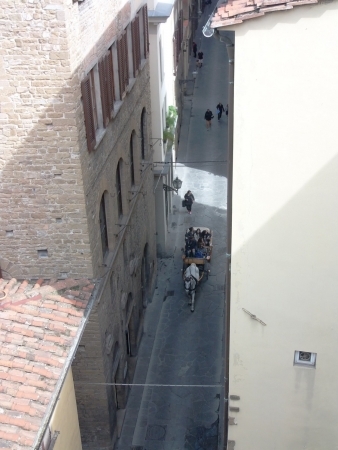 2) Only those with access to the historic centre’s private parking lots may drive into downtown Florence. -on the bus (cost: 2€ instead of 1.20€). For more information, visit ataf.net. - Bus signs only indicate main stops; intermediate stops are not listed. - Due to the construction of Florence's future tramway, bus routes are subject to change. 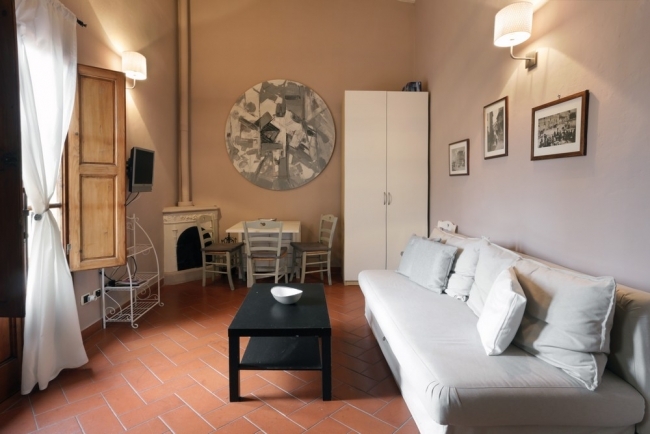 - The cloakroom at Santa Maria Novella station (located near the left exit) is open daily, from 6 a.m. to midnight. Cost: 5€ per bag for the first 5 hours. This apartment is not available on the dates you have requested. Please modify your dates. If your dates are not flexible, be sure to check out the other apartments available on these dates.